History of the USA isn't the only star article → Find more of them! This animated map shows the growth of the United States. The history of the present-day United States of America spans over 30,000 years. In northern America, some Indian peoples developed agriculture, and sometimes even built large cities. During the 17th and 18th century, Protestants from the United Kingdom settled on the eastern coasts of the continent. In 1773, the British colonies wanted to become independent, but the British crown refused to lose their colonies and a war began between the American and English army. After 8 years of war, called the American Revolutionary War, Great Britain was defeated with the help of the French, and the Americans became independent. They called their country United States of America. After their independence, the USA expanded, and began exploring the western parts of North America, where they found gold. The Indians who lived there, were fought and sometimes massacred by white Americans. The USA also needed to produce crops. To produce these crops, they began abducting Africans from the western coasts of Africa, as slaves. Slaves were badly treated and had to work all day. Slavery was only abolished fully in the country, in 1865, as a result of the Civil War. In 1914, First World War began in Europe. The USA sent its army in Europe in 1917. After the war, the USA became richer, and industrialised itself by selling and exporting objects like cars. In World War II, the USA, allied with France and the United Kingdom, bombed the German army. The 6th June 1944, thousands of American soldiers arrived on the beaches of Normandy. Bit by bit the Germans were defeated, and in 1945 war was won by the Americans, but millions of people had died during the war. At the end of the war, the United States was becoming the richest country in the World. Then, the United States made war against Vietnam. During the Vietnam War, thousands of Vietnamese were killed and 10,000 hectares of plantations were destroyed. The USA was enemy with Russia. The USA was capitalist and Russia communist. In Korea, the USA sent its army against the communists, and at the end of the war, Korea was split in two countries: North Korea and South Korea. In 1969, Neil Armstrong, an astronaut, was sent on the moon. In the US, there was still racism. Black and white people were segregated (separated) in public areas such as buses. An American pastor, Martin Luther King, Jr. fought against racism. In 1963, a civil rights march was organised at Washington. This is where Martin Luther King made his most famous speech "I have a dream". But Martin Luther King was assassinated by James Earl Ray while he was standing on his balcony. The 11th September 2001, terrorists from al-Qaeda attacked the World Trade Center, and killed 2,000 people. In 2003, the American army arrived in Iraq, and killed 100,000 people (including civils). Donald Trump is the current President of the USA, since 20 January 2017. 30,000 years ago, the sea was lower, connecting Siberia to Alaska. Tribes followed herds from Asia to America, passing by a stretch of land, called Beringia. They settled in America. Some went to polar areas, becoming Inuit (Eskimos), while others searched more land in the South. They became the first Indians (Christopher Columbus, upon discovering America, thought that he had reached India, and called the inhabitants Indians. Today, they may be called Indians or Indigenous Americans; in the USA, they are called Native Americans or First Nations; in Canada they are named Aboriginals. ), and some settled in present-day USA. The Kincaid Site, an early town from the Mississippian culture. A tablet from Cahokia discovered in 1971 showing a "Birdman". 10,000 years ago, human populations exterminated all mammoths and horses from the country. Buffaloes were also hunted. Indians would only start to ride horses after these were reintroduced to America by Europeans; in ancient times, travel on land was done by walking. In 700 AD, Indians near the Mississippi began to build large constructions. One of their towns, Cahokia, had over a hundred mounds. The city had a large temple, and a house for the chief and his servants. The town was abandoned around 1500. A 1906 painting showing a Pueblo village. Around 750, in present-day Southern USA and Northern Mexico, the Pueblo people began to build villages, called pueblos. Some cities from the Pueblo people had houses on top of the others. Pueblo Bonito, in present-day Southern USA, was a large Pueblo city, built in a deep valley and surrounded by a network of roads. Pueblo Bonito had 800 rooms which housed 1,200 people. Its structure was a large semi-circle with buildings on the edge. In the middle of the town were several sunken rooms, called kivas, who were used for ceremonies. The Pueblo people wove their clothes, which were made from brightly dyed cotton. They carved statues from polished stone. Jugs with bold patterns were made by potters. When Pueblo chiefs were buried, pots with painted spirits were buried with them, and pierced to release the spirits. The modern population of Indian nations includes the following: the Apache, the Cherokee, the Cheyenne, the Lakota, the Mohawk, among many others. 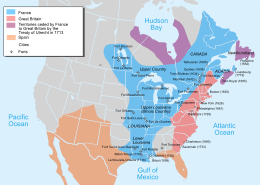 The European colonisation of North America. After the European discovery of the American continent in 1492, settlers began to search land to found colonies in the New World. The Spanish focused their efforts in southern and Central America. After destroying the Aztec civilization, Hernán Cortés established colonies in present-day Mexico. They then headed north and created New Mexico and California, where they encountered various Indian nations. The French, under the reign of Louis XIV, arrived in the Gulf of Mexico, and conquered southeastern North America. This territory was called Louisiana, in French "Louisiane", after the name of their king. In 1534, Jacques Cartier discovered Canada. The British began their settlements in America in the 17th century, on the eastern coast. Thanksgiving at Plymouth, painted by Jennie A. Brownscombe in 1914. In 1607, a successful settlement was started, and Europeans founded the city of Jamestown. In 1620, a group of English Protestants, eager to worship God in their own way, boarded a ship called the Mayflower. They became known as the Pilgrims, or the Pilgrim Fathers. After sailing across the Atlantic Ocean for three months, they landed in present-day Massachusetts, where they founded the colony of Plymouth. Their first winter was extremely harsh, but the local Indians helped them, and half of the settlers survived. After their first harvest, in November, the Pilgrims organised a meal – including some turkey – to thank the Indians for their help. This is why, on every November, Americans eat turkey, and remember the event, in a day called Thanksgiving. After that episode, more Europeans (mostly English) landed in North America, called the New World. They conquered the eastern coast, creating thirteen colonies, which were later to become a nation. The Declaration of Independence, adopted the 4th July 1776. In the 1760s, the United States had already thirteen colonies, but was still controlled by England. As the taxes for the goods coming from England were increasing, the people of the colonies rebelled. In 1773, in the port of Boston, some people assaulted a trade ship transporting tea boxes, which they threw overboard, as a sign of their refusal to pay taxes. The equivalent of 800,000 pounds of tea sank in the sea. This episode was known as the Boston Tea Party. The 4th July 1776, the Thirteen Colonies declared their independence from the British crown. The Declaration of Independence, mostly written by Thomas Jefferson, was adopted that day, and the colonies became an independent country, called "the United States of America". The United Kingdom, who didn't want to lose their colonies, sent troops to America. This was the beginning of the War of Independence or American Revolutionary War, which opposed the new American army and the British. The first battles, like the Battle of Long island (1776), or Saratoga (1777), were won by England, whose soldiers were better armed and prepared. But in 1777, Louis XVI, king of France, sent French troops – led by Lafayette – to help the Americans in their fight for independence. Finally, in 1781, at the Battle of Yorktown, the English were defeated. The Thirteen Colonies officially became the United States, and a nation was born. A few years later in 1787, a new set of basic laws called the United States Constitution was written and adopted. In 1789, George Washington, leader of the Thirteen Colonies, became the first president of the United States. The triangular trade: Europeans sold goods on the western coasts of Africa, where they abducted people as slaves; these slaves were shipped to the Americas, where they were sold, before the ships came back to Europe. Before and after their independence, the United States had trade relations with Europe. To produce their crops, Americans needed workforce. At first, they began using Indians as slaves, but they almost all died. So the colonists later bought new slaves from the western coast of Africa. The African slaves were badly treated. In the ships, they were chained in the hold, and couldn't move for the whole trip. Diseases were quickly spread by rats; most of the slaves fell ill and died. When they arrived in America, the survivors were sold as slaves, to the European landowners. They had to work all day to produce crops, and were whipped by their owners. When slaves tried to escape, they were found and punished, often violently. The northern states of the newly formed USA abolished slavery soon after the independence, around 1800. However, slavery continued in the southern states much later, and was only abolished officially in 1865. Map of the United States in 1789. When they became an independent country, the United States covered a much smaller territory than today. Only the eastern coast was colonised, while Indians lived in the western part. The southern area of the present-day USA (from California to Texas) was occupied by Spain; and from Newfoundland (eastern Canada) to New Orleans, France had colonies. In 1812, the United States bought French Louisiana from France. All the French territories became American, and the United States doubled its size: this was called the Louisiana Purchase. Davy Crockett, the leader of the Americans during the Texas Revolution. He was killed at the battle of the Alamo. People from the United States settled in the northern parts of Mexico, in what has become present-day Texas. In 1835, they declared their independence from Mexico. But a war broke up between the Mexicans and the Americans. The Americans were led by Davy Crockett, and the Mexicans by Santa Anna. After ten years of war, including the battle of the Alamo, the Mexicans were defeated and Texas joined the USA. Slowly, people began to settle in the western part of the continent, in what is known as the Wild West, or the American frontier. These settlers, known as pioneers, found, in 1848, gold in California. During this period called the Gold Rush, many Americans rushed there, hoping to find gold in the rivers or in mountains, and become richer. They went there in wagons, pulled by oxen or cows. The journeys were difficult, but some of them found gold. Sitting Bull, a chief of the Lakotas who fought against the US army. The United States had already won all French Louisiana during the Louisiana Purchase, and Texas during the Texas revolution. Indians lived in the western part of present-day USA. Settlers moved west, where lived Native Americans. Bit by bit, their land was taken away. Some tribes, like the Lakotas (led by Sitting Bull), fought against the US army (led by General Custer) to defend their land. They won some battles, like the battle of Little Big Horn, but were defeated at the battle of Wounded Knee. The US army colonised all Indian territories, killed thousands of buffalo, and forced the Indians who had survived to speak English and live in camps guarded by US soldiers. Once the US army had wiped out all Indian tribes, the map of the US, at the end of the 19th century, looked like the map of present-day US. The country had become one of the most powerful nations of the world. The battle of Gettysburg, drawn by Currier and Ives. The Union soldiers wore blue jackets. The Confederate soldiers had grey ones. Abraham Lincoln, the president of the US during the war secession. While slavery had been abolished in the early 19th c. in the northern USA, southern states continued to allow slavery for growing cotton and tobacco. In 1860, Abraham Lincoln was elected president of the USA. He was opposed to slavery, and many people in the south were angry with him. The southern states decided to break away from the United States and form an independent country (a process called secession), but the American government rejected that demand. In 1861, a war broke out between the Northern States or Union states, and the Southern states or Confederate states, a war that lasted four years. The Union had more soldiers, called the Yankees, but the Confederate had better generals, and won many battles at first. In 1863, in Pennsylvania, the Union states won the battle of Gettysburg. After this victory, the Yankees advanced in the Southern states. They destroyed and burned cities, towns, villages on their passage. They also broke railway lines to stop the Confederates from bringing provisions, weapons and food to their soldiers. By 1865, the Confederate soldiers became weaker, and they surrendered. The war was ended, but hundreds of soldiers had died on both sides, in land and naval battles, and large areas in the southern states had been destroyed. Slavery was finally abolished, and thousands of black slaves were freed. But five days later, Abraham Lincoln was assassinated by an extremist Confederate supporter. American troops in the First World War. In 1914, the First World War began in Europe. At the beginning, the United States didn't send soldiers on the battlefields. But in 1917, German submarines, called U-boats, from the German word Unterseeboot, sunk American cargo ships and other ships containing civilians passengers, like the Lusitania. Also, Germany sent a secret coded message, called the Zimmerman Telegram (from the sender Arthur Zimmermann) to Mexico, which suggested that the two countries could attack the USA. But English spies found the message and announced the attack to the United States. Many people were angry against Germany and wanted to send American soldiers in Europe to fight against Germany. After the First World War, the United States was one of the richest nations in the world. Cities like New York City and Washington, D.C. grew bigger, and new products were invented and exported to the rest of the world. 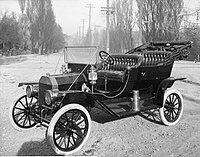 A car called a Model-T. In the US, new objects like cars were developed. Modern engines were needed and factories were created. For his Model-T car, Henry Ford even developed a new way of organising factory work. The USA exported lots of industrial objects and became richer. In the 1920s the Americans wanted to forget the war and have good time. African-Americans invented a new music called Jazz. Some women, called flappers, had their hair cut short. The 1920s is often known as the Jazz Age. In the 1920s, racism was still important in the US, and racist Americans called the Ku Klux Klan killed African-Americans illegally at night. They were dressed in white, and hooded for not being identified. The Ku-Klux-Klan would catch African-Americans, and then burn them on a cross. Some Americans thought that the problems came from the immigrants and labor leaders, whom they said were Bolsheviks (Russian Communists). Between 1920 and 1933, it was made illegal to drink alcohol. This was called the Prohibition. But some people still drank illegally alcohol in bars called speakeasies. Votes were organised against it. Some gangsters like Al Capone became very rich by selling illegally alcohol. American soldiers coming on Omaha beach. In 1939, World War II began in Europe. At the time, the USA president was Franklin Roosevelt. He allied with the president of the United Kingdom, Winston Churchill, and the French general Charles De Gaulle, and together they bombed Germany and France (occupied by the Nazis). Some of the bombs launched by the Americans accidentally killed French people, and some French thought that the Americans were their enemies. The 7th December 1941, the Japanese Empire attacked an American port in Hawaii called Pearl Harbour. The Americans in England would also communicate to French resistant by writing secret messages and tying the paper to pigeons who would come in France and deliver it. In 1944, Roosevelt had a meeting at Moscow with the president Churchill and the soviet dictator Stalin. They organised a gigantic attack against the German Nazis. Firstly, in the bay of Biscay, the American army made fake soldiers with fake tanks and fake guns. On the London radio, it said when the D-Day would arrive by telling a song or a sentence so that a resistant in France could understand it. Then, the 6th June 1944, as the Germans sent its army on the bay of Biscay, 10,000 American soldiers arrived on the beaches of Normandy. This was called the D-Day. The German army quickly sent all its army in Normandy against the Americans. In passing, they destroyed two villages in southern France, killing everybody. A huge line of Nazi tanks went from southern France to Normandy. In Normandy, thousands of soldiers arrived by falling in parachute from aeroplanes or in boats. Slowly, the German army was pushed. The American Army took one month for gaining a few kilometres, but then they went faster and won against the Germans. Adolf Hitler, the German dictator, killed himself. In 1945, the Allies had won, but millions of people had died in the terrible war. However, Germany was allied with the Japanese Empire. 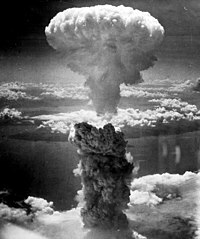 The Americans launched two nuclear bombs at Hiroshima and Nagasaki. The two bombs killed thousands of Japanese civilians. At the end of the 2nd World War, the Americans had arrived in France and went up to Germany, while the Russians had passed by Poland. The two armies arrived almost at the same time at Berlin, and had together annihilated the Germans, but there was a problem: the USA was capitalist while the USSR was communist. The two huge and powerful countries began to be better than the other one. The term "Cold War" is used because the USA and Russia never directly fought each other. In 1945, after the Japanese occupation, Korea was divided in two parts: North Korea was for the USSR, and South Korea for the USA. Then, allied with China and Russia, North Korea (governed by Kim-Il Sung) decided to send 75,000 soldiers to attack South Korea in June 1950. The North Korean army pushed the South Korean army up to Busan. Then, the United States made war against Vietnam. During the Vietnam War, thousands of Vietnamese were killed and 10,000 hectares of plantations were destroyed. In the US, there was still racism. Black and white people were segregated (separated) in public areas such as buses. An American pastor, Martin Luther King, Jr. fought against racism. In 1963, a civil rights march was organised at Washington. This is where Martin Luther King made his most famous speech "I have a dream". But Martin Luther King was assassinated by James Earl Ray while standing on his balcony. The 11th September 2001, terrorists from al-Qaeda attacked the World Trade Center, and killed more than 2,000 people. In 2003, the American army invaded Iraq, and killed 100,000 people (including civilians). In 2008, Barack Obama was elected president of the USA: he was the first black president of the US, and was then re-elected in 2012. In 2016, Donald Trump, from the Republican party, was voted for presidency, and he is still president. ↑ See Bingham, Chandler & Taplin (eds) (2000), pp.276. ↑ See Bingham, Chandler & Taplin (eds) (2000), pp.277. ↑ See Bingham, Chandler & Taplin (eds) (2000), pp.322. Bingham, Jane; Chandler, Fiona; Taplin, Sam (2000). The Usborne Encyclopedia of World History. London: Usborne. ISBN 978-1-4095-6251-1. This page was last edited on 10 April 2017, at 08:04.